The mys­tery woman who blew £16 mil­lion in Harrods at the cen­tre of a High Court bat­tle to seize her ‘unex­plained wealth’, is the wife of the dis­graced for­mer boss of Azerbaijan’s biggest bank, MailOnline can reveal. 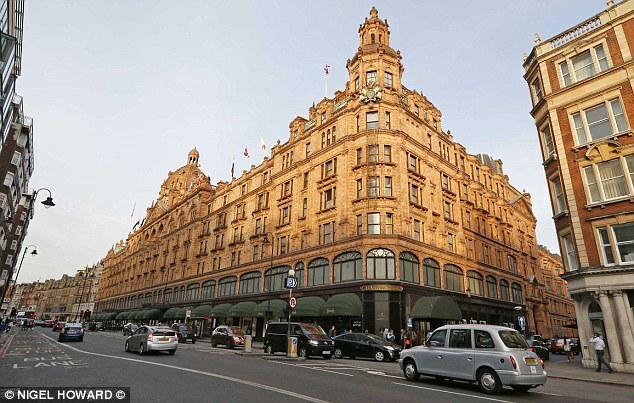 Zamira Hajiyeva, 55, used 35 cred­it cards issued by her husband’s bank to splash out £1.6 mil­lion on shop­ping every year for a decade at Britain’s most extrav­a­gant depart­ment store, locat­ed just a stone’s-throw from her lav­ish London home. As chair­man of the International Bank of Azerbaijan, Jahangir Hajiyev and wife Zamira enjoyed all the priv­i­leges of the super-wealthy — trav­el­ling the world in a Gulfstream pri­vate jet and drink­ing the finest wines. Only a brief kid­nap­ping by her husband’s ene­mies in 2005 appears to have trou­bled strik­ing brunette Zamira’s gild­ed life. While nev­er earn­ing more than £54,000 a year at the bank, the cou­ple assumed huge wealth, buy­ing two-adjoin­ing Belgravia town­hous­es for £11.5 mil­lion in cash in 2009 and an exclu­sive Berkshire golf course worth £10.5 mil­lion a few years lat­er. Mrs Hajiyeva’s home in Knightsbridge, cen­tral London, was bought through a British Virgin Islands firm with a mort­gage of ‘up to £7,475,000’ the Evening Standard reports. However the pow­er­ful couple’s mul­ti-mil­lion finan­cial empire came crash­ing down when Hajiyev was arrest­ed in his native Azerbaijan in December 2015 accused of embez­zling more than £100 mil­lion from the bank. He is cur­rent­ly serv­ing a 15-year jail sen­tence in the coun­try for fraud and embez­zle­ment. Luxury items Zamira bought at Harrods dur­ing her ten-year £16-mil­lion spend­ing spree includ­ed a £48,600 piece of Cartier jew­ellery and three items of Boucheron jew­ellery worth £40,000, £42,000 and £39,000 – just weeks before buy­ing her £11,500 mil­lion Belgravia home. Heralded for his pro­fes­sion­al acu­men, Hajiyev was award­ed the pres­ti­gious Queen Victoria Commemorative Medal and named Best Banker in a Crisis by Europe’s busi­ness lead­ers, for his role in lead­ing Azerbaijan through the 2008 finan­cial cri­sis. Hajiyev’s per­son­al wealth was val­ued at £55 mil­lion in 2011, court doc­u­ments have revealed. Zamira revealed her hus­band gave her a £1 mil­lion-plus present and received a month­ly allowance of £20,000 but she began sell­ing off the ‘fam­i­ly sil­ver’ at Christie’s, after he was arrest­ed, court papers have shown. Zamira fled Azerbaijan but she was arrest­ed ‘in absen­tia’ on charges of ‘mis­ap­pro­pri­a­tion of state funds’ and remains on Azerbaijan’s ‘want­ed-list’. Thrown to the wolves by the Azerbaijan’s rul­ing elite that he once called friends, Hajiyev was jailed for 15 years and ordered to pay back £28 mil­lion, fol­low­ing a high­ly pub­li­cised show-tri­al in October 2016. Zamira sought sanc­tu­ary in London and fear­ing for her safe­ty in her native Azerbaijan, she asked to live per­ma­nent­ly in the UK, apply­ing to the Home Office for ‘Leave to Remain’. Meanwhile finan­cial advis­ers set up a series of off-shore shell com­pa­nies to pro­tect the Hajiyeva’s vast assets from the Azeri author­i­ties. Their adjoin­ing Belgravia town­hous­es was bought by Vicksburg Global Inc, a com­pa­ny incor­po­rat­ed in the British Virgin Islands for £11.5 mil­lion in 2009. A few years lat­er anoth­er off-shore com­pa­ny bought the exclu­sive Mill Ride Golf Club in Ascot, Berks, for a cool £10.5m. Zamira Hajiyeva is the ben­e­fi­cial own­er of both com­pa­nies, the British Virgin Island Financial Investigation Agency have con­firmed. Jet-set­ting around Europe or strolling along the tidy streets of Belgravia, Zamira Hajiyeva was just anoth­er rich ex-pat who had hid­den her mon­ey in London. But a new law tar­get­ing gang­sters, cor­rupt politi­cians, ter­ror­ists and mon­ey laun­der­ers threat­ens to strip Ms Hajiyeva of her vast wealth, which the National Crime Agency (NCA) believe was the stolen by her hus­band from the International Bank of Azerbaijan where he worked. NCA inves­ti­ga­tors are demand­ing the 55-year-old explain how can afford her lux­u­ry lifestyle includ­ing British prop­er­ty worth £22 mil­lion, mak­ing her the sub­ject of an ‘Unexplained Wealth Order’ (UWO). The UWO, which is part of the Criminal Finance Act, enables British author­i­ties to freeze and recov­er the prop­er­ty of indi­vid­u­als who are unable to explain how they acquired assets worth more than £50,000. An UWO can be enforced by the National Crime Agency, Her Majesty’s Revenue and Customs, the Financial Conduct Authority, the Serious Fraud Office or the Crown Prosecution Service. However Ms Hajiyeva denies her assets are the pro­ceeds of crime, claim­ing her wealth is the result of husband’s skil­ful invest­ments. She told the High Court in a wit­ness state­ment: ‘My hus­band was in 2009 a man of sub­stan­tial means. He was very well off when we mar­ried in 1997 and has accu­mu­lat­ed cap­i­tal and wealth since the ear­ly 1990’s. She is fight­ing the NCA all the way. Ms Hajiyeva has instruct­ed a team of high­ly skilled lawyers, includ­ing a £500-an-hour bar­ris­ter, James Lewis QC, to argue her case in the courts. Hajiyeva has been des­per­ate to keep her name out of the news, with her lawyers ask­ing for all court pro­ceed­ings to be held in pri­vate. However suc­ces­sive judges in the High Court and the Court of Appeal have refused appli­ca­tions to keep her anony­mous and Zamira Hajiyeva can today be named for the first time as the sub­ject of Britain’s first Unexplained Wealth Order. The National Crime Agency were able to track Mrs Hajiyeva’s lav­ish spend­ing. Court papers revealed three sep­a­rate loy­al­ty cards were issued to Mrs Hajiyeva, and between September 2006 and June 2016, a total of £16,309,077.87 was spent by the use of the cards under the Harrods Customer Loyalty Rewards Card Scheme. Mrs Hajiyeva was recent­ly spot­ted walk­ing her Pomeranian dog in the streets close to her house. Manager of the Mill Ride Golf Course said they were not aware of any court action. The NCA wel­comed the news that Mrs Hajiyeva can now be iden­ti­fied. ‘The NCA ful­ly sup­ports an open and trans­par­ent jus­tice sys­tem that helps demon­strate our deter­mi­na­tion to ensure that the UK is not seen as a soft tar­get for the invest­ment of illic­it finance. ‘Where we can­not deter­mine a legit­i­mate source for the funds used to pur­chase assets and prime prop­er­ty it is absolute­ly right that we ask prob­ing ques­tions to uncov­er their ori­gin. ‘Unexplained wealth orders have the poten­tial to sig­nif­i­cant­ly reduce the appeal of the UK as a des­ti­na­tion for illic­it income.